When I am teaching my history standards, I really like to teach the students to look at both sides of a situation. Rarely is history cut and dry and I want the students to see that, just like the world we live in now, there are a lot of ways to look at a situation. Last year, I wrote about how I did this with the Boston Massacre, but this year, we started early on this topic when discussing Christopher Columbus and his role in not only US/World history, but in our culture at large. 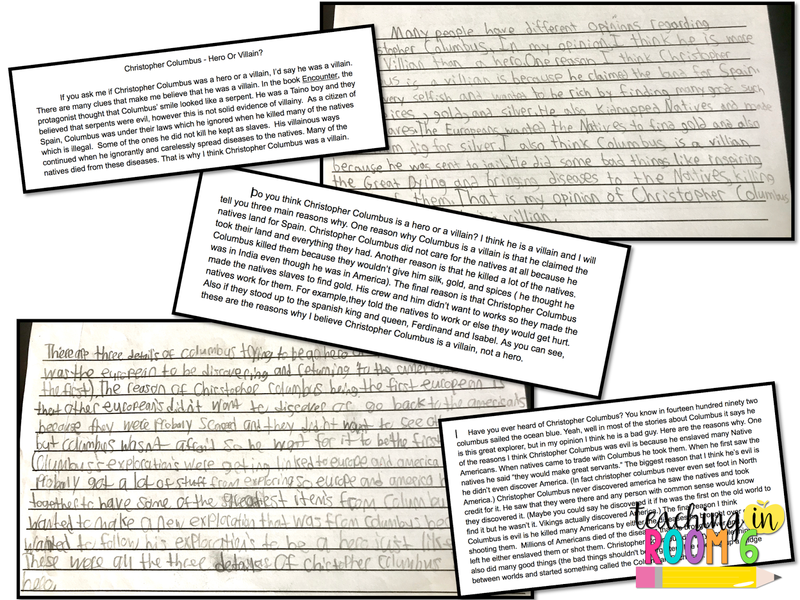 I asked the students what they knew about Columbus. Many knew the old tale, "In 1492, Columbus sailed the ocean blue." They knew there was a day dedicated to him and that he was an explorer who discovered America. One even said he was the first person to ever set foot in America. So....they didn't know much. Overall, they did seem to have a pretty positive view of them man (I mean, he has a day named after him so he must be great!) so I wanted to try and challenge them to think a bit more critically at Columbus the man and what he actually did while he was alive. 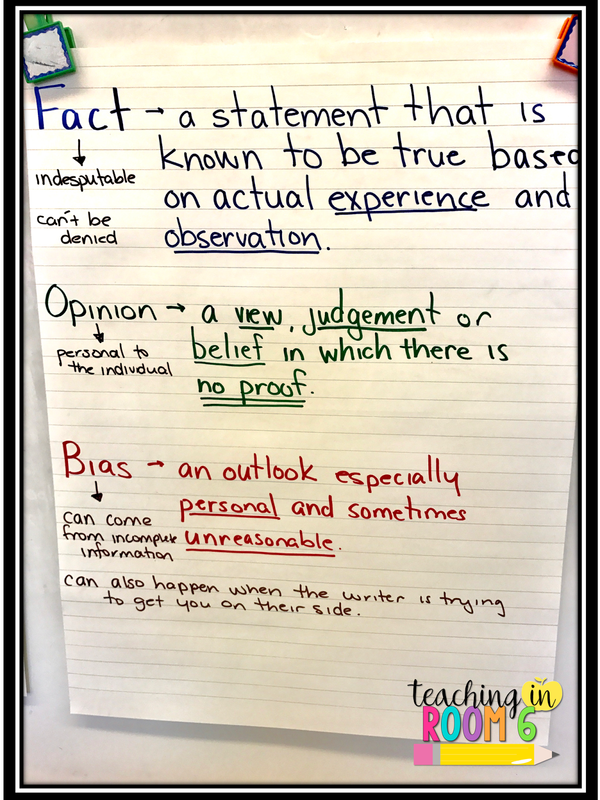 We began by talking about bias and how when discussing historical events and people, sometimes there is quite a bit of bias that takes place when looking at the information presented. People sometimes have agendas when writing historical pieces, or declaring celebration days, so I wanted to set out right away the difference between what is actual historical fact and what isn't. 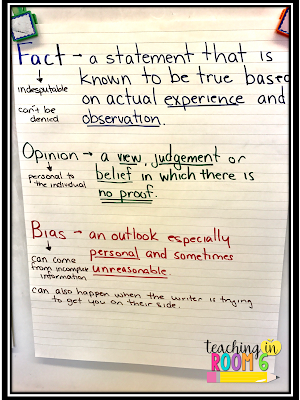 We created this anchor chart detailing fact, opinion, and bias and discussed how they all play a role when looking at documents. After the discussion, students were given an article from a book called "Great Explorers". (which is a super old book that I have had for 20 years...and is nowhere to be found on Amazon. :/ ) I asked them to think critically about the *word choice* in the article. What was the article's bias? 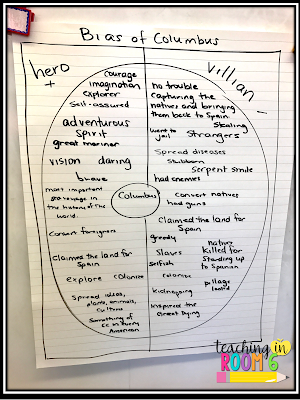 Based on the word choices, does this author think Columbus is a hero or a villain? Why? The students and I made notes on our papers, finding words that would make us, as a reader, feel a certain way about Columbus, and noting why. 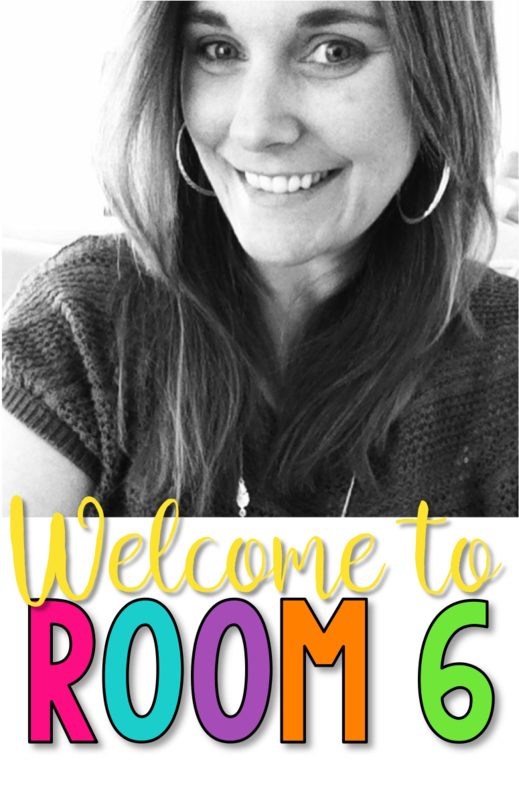 Then, I read the students the book Encounter (Voyager Books) by Jane Yolen. (my affiliate link will take you to Amazon to buy the book.) This is a book about a Taino boy who is there the say Columbus arrives on his island. Again, we looked for biased words that would make us, as a reader, feel one way or the other about Columbus. Again, I asked why the author might be wanting us to think this way. The kids really got into this discussion. They very much felt for the main character of the book and could see WHY he felt the way he did. Putting themselves in his shoes, they were able to empathize with him and did not see Columbus in the same light as they did after the first article. We discussed how word choice when presenting facts makes all the difference in how the reader reacts to the information. Since we had two very different accounts of Columbus, I created a brainstorm chart to start housing our information. 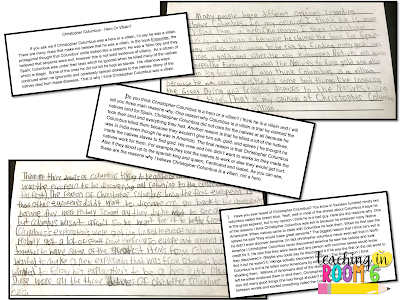 I specifically wanted them to find words that lead us to believe that Columbus was either a hero or a villain. Using both the article and the book, the students went through and helped me list those words. 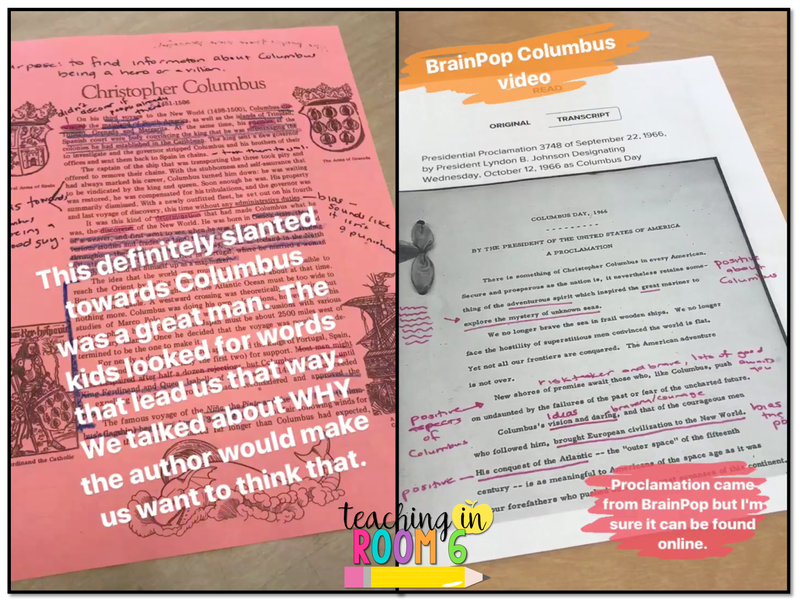 Next, the students watched the BrainPop video on Columbus. This presented both positive and negative information about Columbus' impact on the world at large and the people he encountered along the way. 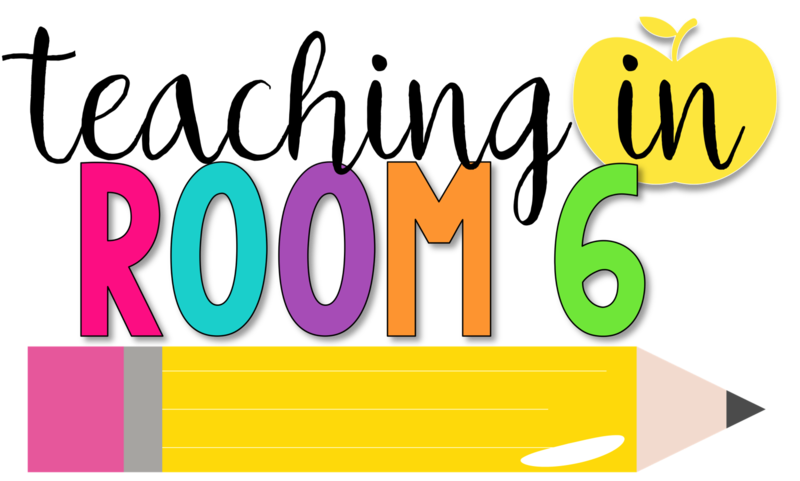 Students made note of this information as well, adding it to our brainstorm chart. Finally, I presented the kids with a proclamation from President Lyndon B. Johnson given to commemorate Columbus day. 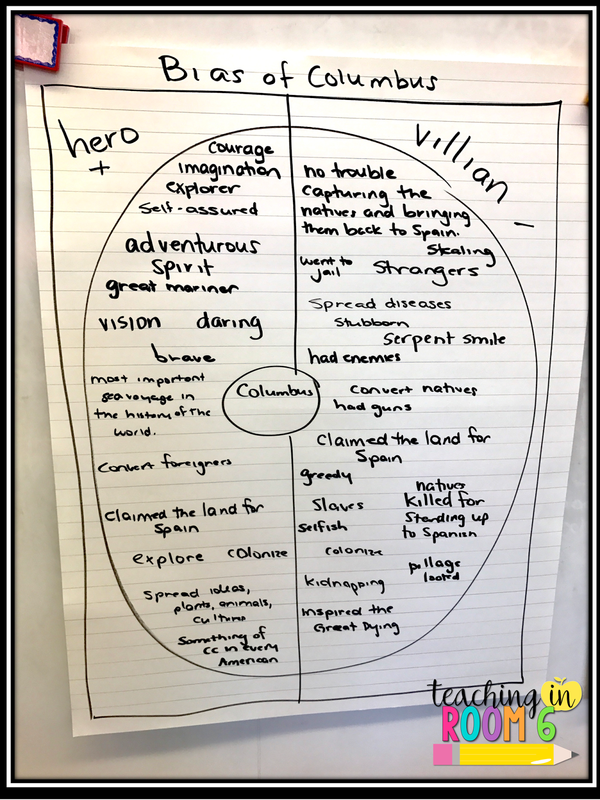 Again the students looked for words that slanted towards Columbus being a hero or a villain. Most words definitely slanted towards him being a good guy who set off into the world and explored. He was adventurous and brave. We then discussed WHY Johnson would want to make Columbus out to be a hero. You see, in this particular address, Johnson likened Columbus to all Americans. He wanted a feel good speech that would pump up the American morale....and saying Columbus pillaged villages, taking their inhabitants as slaves, doesn't really jive with that message. Again, they added the words to the brainstorm chart. All in all, this took about a week to complete. I think by the end of the week, the students really were able to see that when looking at historical documents taking in bias and word choice is very important to help sort out fact from opinion. 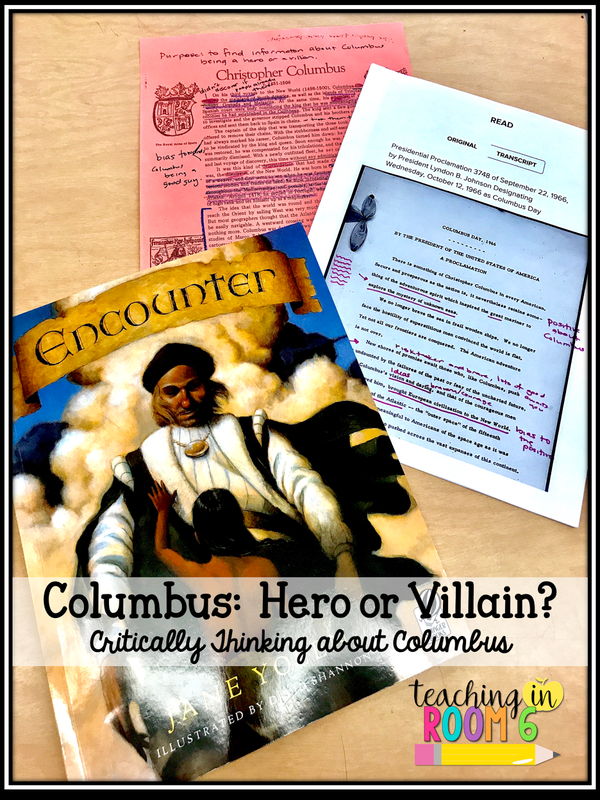 Have you studied Columbus in your class? What are some ideas you have to add to this lesson to make it even more fact-based and critically thoughtful? I love this. Any chance there's a version of the Great Explorers passage online? Or have you found something similar?